HEOS wireless amplifier: turn any speakers into a wireless zone. The HEOS Amp is designed to add HEOS multi-room audio functionality to a pair of stereo speakers, and features the same wireless ease of use as our self-powered HEOS speaker models. 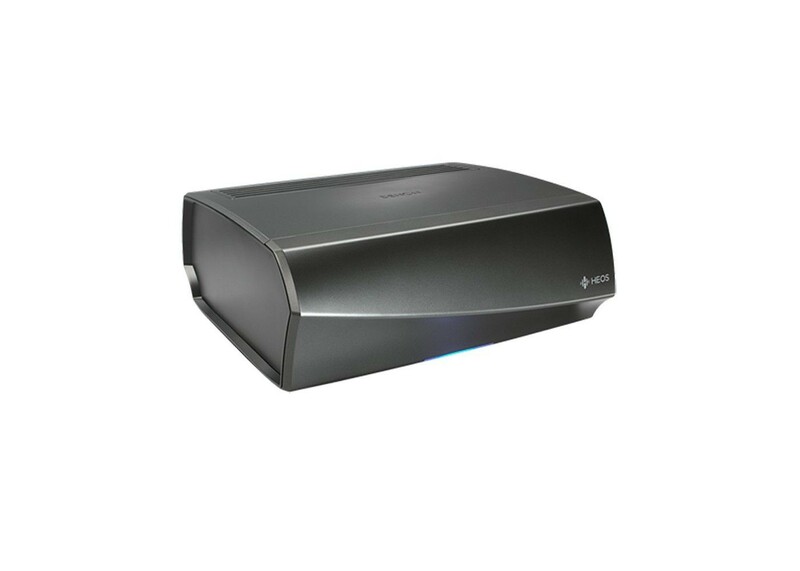 Featuring advanced Class D digital amplification, the HEOS Amp delivers 100 watts maximum power per channel, with lowest distortion and high current capability that provides reliable and stable operation with lower impedance speakers, including 4 ohms models. With the HEOS Amp, you can enjoy listening to your favorite loudspeakers, and the high power rating means that you can enjoy room-filling sound quality even at concert hall levels. In addition to the stereo speaker outputs, the HEOS Amp features additional connectivity, including a sub output for connection to a powered subwoofer. There's also an analog stereo line input (via RCA jacks), and an additional auxiliary input via 3.5mm jack for direct connection to a portable player's headphone output. An optical digital input lets you connect a digital music source such as a CD player, and a USB port lets you connect a portable thumb drive to listen to your favorite tracks. You can also use the USB port to charge your portable device. In addition to the built-in dual band "N" wireless system, the HEOS Amp is also equipped with an RJ-45 Ethernet port for direct connection to a wired LAN setup. As with our HEOS wireless speaker models, you'll be able to stream your favorite music tracks and control the HEOS Amp with our HEOS App, which is available in both iOS and Android versions. With the HEOS App, you can choose to listen to music tracks on your smartphone, tablet or portable audio player, and you also can listen to your choice of internet radio stations, and you can also listen to your favorite music streaming service. The home stereo amplifier lets you choose different songs for each room, or you can listen to the same song in all rooms. Our exclusive digital technology provides precise audio synchronization (within microseconds) to ensure top audio fidelity and stereo imaging quality. The stylish HEOS Amp enclosure features elegant silver accents, and for convenience, there are volume and mute controls discreetly placed on the side panel. Turn Any Existing Pair Of Speakers Into A Heos Zone Now Offering High Resolution Audio Delivering The Ultimate Listening Experience Over Network Or Usb All In The Convenience Of Your Home. Play Any Song In Any Room On Demand From Streaming Services Via Bluetooth Or Wi-Fi Audio Streaming Bluetooth On The Heos Wireless Multi-room Sound System. Apps & Streaming Services: Cloud music, streaming music and your music library—all your favorite sources are supported by this amazing FREE app. Amazing Sound Quality: It’s no accident that HEOS speakers produce pristine sound. They are engineered by the experts at Denon, innovators in audio for more than 100 years. EASY SETUP: It’s amazing how quickly you can start listening to your HEOS speakers. Place your speakers, and you will be listening to music in minutes. It’s really that simple. HEOS + Alexa — Speak Your Commands: Use your voice to stream your favorite music services to this HEOS-enabled device. Ask Alexa to play music from Pandora, Spotify, Amazon Music and much more. Switch between inputs (Blu-ray, DVD, Media Player, etc. ), turn volume up or down, pause, mute and play the next song — all with your voice. To start streaming with Alexa voice commands, open the Alexa app and select “Skills.” Add HEOS Home Entertainment to enable. Then, go to Smart Home in the Alexa app menu and choose Devices and Discover or say “Alexa, discover my devices. "With HEOS Home Entertainment and Alexa, you can stream to this product and any other HEOS-enabled device. Play music from Pandora, iHeart Radio, Amazon Music Unlimited, Tidal, Napster, Spotify, Deezer and SiriusXM. All you have to do is ask. The HEOS Amp is designed to add HEOS multi-room audio functionality to any pair of stereo speakers, and features the same wireless ease of use as our self-powered HEOS speaker models. Featuring advanced Class D digital amplification in a sleek compact chassis, the HEOS Amp delivers 100 watts of power per channel, with low distortion and high current capability. USB Storage: Connected to the HEOS Amp or other HEOS player. Aux Input: Analog or optical digital sources connected to the HEOS Amp or other HEOS players. Music Downloads: DRM-free downloads from any service. Subject to audio format support. Aux Input: Analog or optical digital sources connected to the HEOS Amp or other HEOS players. Wireless Connectivity: Supports latest dual band wireless networks (including 802.11 a/b/g/n/ac standards). Product Finish: Gunmetal Silver front, top and back panels with black sides.